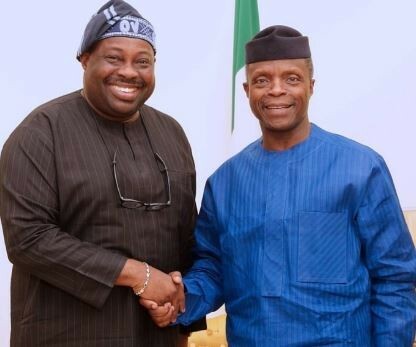 Dele Momodu has described Vice President, Yemi Osinbajo as 'smart, intelligent, cerebral, God-fearing, energetic and the major pillar of Buhari's Presidential campaign'. He also said, 'he is one of the reasons many of us placed high hopes in the BUHARI Government. He and a few others have made significant contributions to the modest achievements of this government but I doubt he's been able to perform optimally because of the type of banal politics of parochialism we play in our clime. No one would have noticed the palpable weaknesses of this government if PROF was allowed to run shows in a more professional manner'. We saw the obvious difference anytime he had acted as President. He is now the major pillar of Buhari's Presidential campaign crisscrossing Nigeria and beyond to make up for the gaping holes in a government that promised so much but delivered too little. I pray he is not being overused and over-stressed at the moment and hope, when tomorrow comes, and by some stroke of miracle they win, he would not be discarded and made redundant while some invisible forces begin to flex MUSCLES again.